This tour is for 2-5 people maximum. You'll be taking a semi-private tour. Tour to one of the most photographed places in Washington: Deception Pass Bridge. Walking across this 180 foot high bridge over tumultuous Puget Sound and ocean waters is an exciting experience with fantastic views. Lunch is not included, but we've got some great restaurants to choose from in quaint Coupeville with Sound views and great food. If you like mussels, you'll love Front Street Grill. Experience the magic of island life, enjoy visiting a light house and walking a very tall bridge, and ride on a ferry. Travel from Seattle in our comfortable SUV, up interstate 5, viewing farmland and interesting topography caused from flooding and previous volcanic activity. 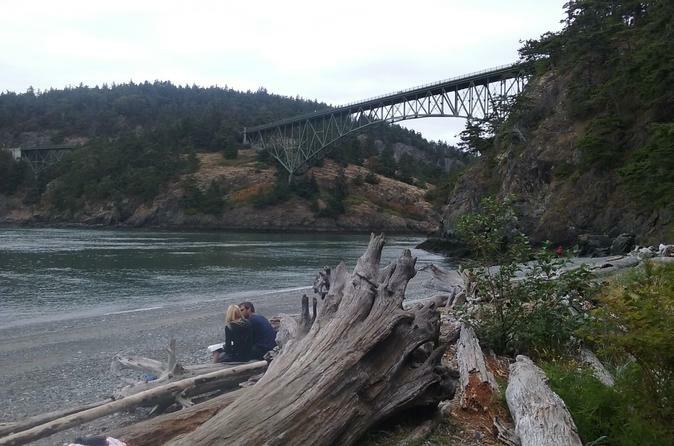 One of the most visited places in Washington by locals, Deception Pass Bridge is often overlooked by visitors to our region. A must see, it's very beautiful here. Walk across the bridge and take in the beauty. It's fantastic! Then you're off to the historic town of Coupeville for lunch (on your own), with delicious locally grown mussels and other wonderful food choices if you're not a shellfish eater. Next stop, a light house, then if you wish, an historical military fort built in about 1902. Then it's time for the ferry ride to get off the island and back to town.